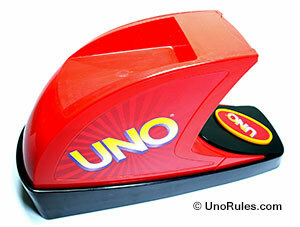 Uno Attack is a popular adaption of the original Uno game that involves an electronic card shooter. The shooter has a launch button, and when pressed, 0-12 cards can be shot out. 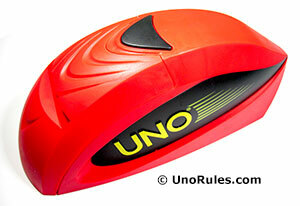 Uno Attack is also known as Uno Extreme in Canada and the UK. Quite similar to the newer Uno Blast, Uno Attack combines the gameplay of Uno with the fun and unpredictability of a card shooter/launcher. Each set consists of 112 cards and a battery powered shooter or launcher. The shooter device itself has been updated by Mattel to a sleeker version and the number of cards and their types has been amended. Please read on below to find out! The old launcher has a “shelf” on its cover to enable the Discard pile cards to be placed. The new version though, does not have any shelf or space for that purpose. Its cover is also harder to open than the old one. Basically, you have to yank it open each and every time, so do take care not to break anything! The new shooter also tends to spit out more cards than the old version, thus prolonging the game, according to some people. What the new version has going for it though, is that its launching mechanism seems to be more powerful than the older version, besides being smaller and sleeker. It also plays a sound every time its launch button is pressed. Both shooters run on 3 “C” sized batteries. Top Row, left to right (Discard All, Hit 2, Wild Attack-Attack). Bottom Row, left to right ( Reverse, Wild, Skip). Discard All – When played, this card enables one to get rid of all his/her cards that are of the same color as it. You can also play it on top of another Discard All card. If the first card of the game happens to be a Discard All card, the first player begins play with a card of the same color (or another Discard All). Reverse – Reverses the flow of the game from clockwise to counter-clockwise, and vice versa. Skip – When played, the next player in turn must skip his/her turn. If turned up at the start of the game, the first player loses his/her turn. Wild – This card enables the one who plays it to play whatever color he/she chooses, and it can be played at any turn. Hit 2 – Play this card to force the next player to hit the Launcher button twice. If cards come out, that player must collect them all, but he/she cannot play anything and their turn is skipped. If this is the first card turned up, the first player must hit the Launcher twice. Wild Attack-Attack – If you play this card, you get to choose anyone to “attack”, as well as any color you desire. Turn the shooter towards the person that you are “attacking” and press the launcher button TWICE. That “attacked” person needs to collect all the cards that shoot out, and play then continues with the next player. Trade Hands – Trade Hands card is a powerful card. Play it, and you must trade all your cards in hand with your opponent’s cards. So if you trade with a player who has a lesser number of cards (let’s say with two cards), you are closer to getting rid of all your cards! However, you are forbidden from going out of the round with this card. 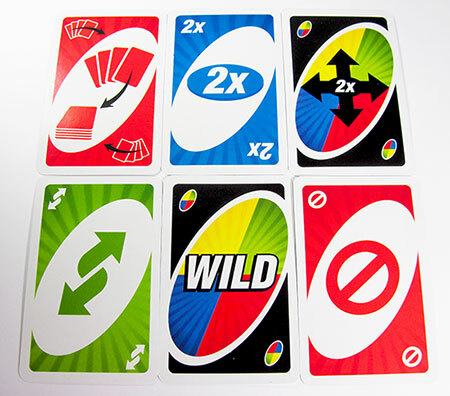 Wild All Hit – Anytime this card is played, everyone in the game (excluding the person who played the card) must hit the Launcher button once, and any cards that come out must be collected by the “lucky" person. If turned up at the start of the game, everyone including the first player must hit the Launcher button once. This is also a Wild card, so the person who plays it can choose whatever color he/she wants, and play it. Wild Hit Fire – This card is bad news for the next player, because if played, he/she needs to hit the Launcher button, repeatedly if necessary, until it spits out cards. The cards must be taken by that player, who then forfeits his/her turn. 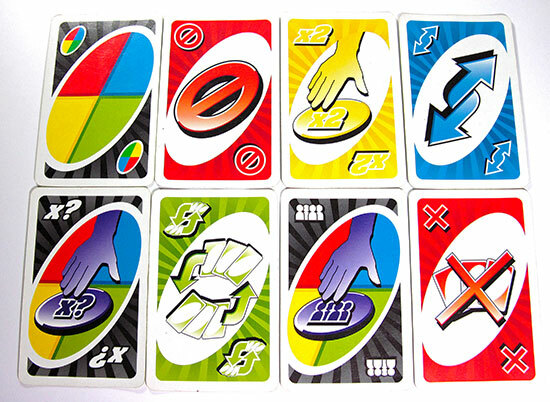 If turned up at the beginning, the first player must hit the Launcher button and collect the cards. Being a Wild card, whoever plays this card has the right to call out the color he/she wants to play, and play it. 2-10 players may play the game at any one time. Gameplay is similar for both old and new versions, notwithstanding the different Action cards in both. Choose a Dealer using any method you desire (normally conducted by everyone picking a card and the Dealer is the one with the highest card number). The Dealer shuffles the cards and deals out 7 cards to every player. The remaining cards are placed inside the Launcher, and one card is taken out (Discard pile). The cover is closed, and the sole card is placed in the prepared space on the cover top as the Discard pile. The first player has to match a card in the Discard pile, either by color or number or symbol (Action card). Or else, he/she can play a “Wild” card to change the current color in play. If there is no matching card to play, the player needs to hit the Launcher button. If nothing happens, that player is safe, and play moves on to the next player in turn. If cards shoot out, that player must collect all the cards and add them to their hand (even for cards stuck halfway in the Launcher). Players must yell “Uno” when they first place down their second to last card. If an opponent catches them not saying “Uno”, the player has to press the Launch button twice. Once you discard all your cards before anyone else, you win the round. Reverse behaves like Skip, since there are only two players. Play Reverse, and you can have another turn. If you play a Hit 2 card, your opponent must the Launcher button twice and play goes back to you since there is nobody else. An alternative way to win the game as suggested by Mattel is to keep a running tally of the points each player is left with at the end of each round. When someone reaches 500 points (or whichever figure that is mutually agreed upon), the person with the least points is declared the winner instead.